Iconic motor yacht OCEAN EMERALD draws a lot of attention with her radically modern design and extremely voluminous interior. She had a starring role in the December 2015 Xtreme-sport remake of 1991 cult movie POINT BREAK and provides a spacious platform for glamorous parties as well as family get togethers. Designed by renowned architect Norman Foster, she was built by Italian shipyard Rodriguez Yachts in 2009 and completely refitted in 2015 and 2016. Her superstructure is placed forward to maximize outdoor terrace space and interiors are opened up to daylight and views. 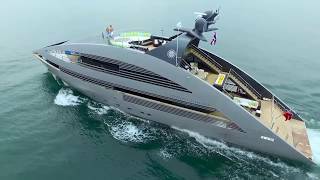 Altogether, space has increased with over 30 percent, compared to traditionally designed yachts of her size. OCEAN EMERALD offers a stylish playground in the sun with several over-sized sundecks with sun beds, loungers and bar. While at anchor, the upper-deck Jacuzzi is popular for a refreshing dip in-between sunbathing and relaxing. The main deck salon has panoramic windows around. The informal upper deck salon has a ‘Beach House’ feel and has a bar, game station and an extensive movie library. The 'Beach House' adjoins the exterior deck, ideal for al-fresco dining. A state of the art lighting system changes the mood from light and bright beach, to sultry lounge bar. OCEAN EMERALD has five cabins, including a spectacular full-beam master on the main deck. On the lower deck are two VIP double cabins and two twin cabins with an extra Pullman bed. Decks are linked by a glass spiral staircase, designed to draw daylight down through to the guest accommodation. A stabilization system reduces roll motion; even guests who have not found their ‘sea legs’ yet, will feel comfortable on board at all times. She has a proven 'safety at sea' record and completed long passages (a.o. from Phuket to the Philippines in March 2016) with ease, despite fairly rough weather conditions. The OCEAN EMERALD crew, most of whom have been ,long-term on board deliver highly personalised service. A French gourmet chef plus a Thai chef create the most delicious Western and Asian dishes including lots of fresh fish and seafood. OCEAN EMERALD is available in Thailand and Malaysia and surrounding countries. From April/May - October she normally cruises the east side of Thailand (Pattaya/Koh Samui) and from November - March/April the west side (Phuket). The unspoiled Anambas Islands can be visited from May/June until September/October and the Mergui Archipelago of Myanmar from November until April, depending on the booking schedule. She has numerous water toys and recently acquired a New Axopar tender, a good chase boat for fishing and/or exploring with a max speed of 50 knots!